(CNN) -- The 2016 Olympic Games in Rio de Janeiro will include rugby union sevens, a shortened version of the 15-player game, and golf as sports, the International Olympic Committee (IOC) announced. The IOC announced Rio's successful bid for the 2016 Olympic Games last week. Two months ago the IOC's executive board voted to include the sports in the program, a proposal that was ratified by the body's members at a meeting in Copenhagen, Denmark, on Friday. Rugby sevens, a sport played with exactly the same rules as the regular version -- just with less players, garnered 81 votes in favor while eight were against and one abstained. Golf was voted in with 63 votes to 27, with two abstentions -- it means the number of "Olympic" sports has reached the IOC's stated maximum of 28. Blog: Money, money, money should be new Olympic motto. 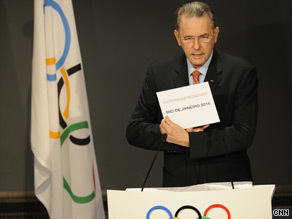 The vote was delayed as some IOC members cast doubt on the selection process that had seen the two sports put forward, but on announcing the result IOC president Jacques Rogge said: "Time will show your decision was very wise." The two disciplines will be part of the 2016 and 2020 Games as a result of the vote, a move that prompted IRB president Bernard Lapasset to tell reporters: "This is an historic moment for our sport and for the global rugby community, who were united in their support." Rugby's world governing body, the IRB, has promised to end its World Cup Sevens event in order to allow 12 men's and women's teams to take part in the competition. Similarly, the International Golf Federation (IGF) has said that of the 60 players who will compete in the men's and women's tournament over 72 holes, the world's top stars will all be present. The executive director of the IGF's Olympic Golf Committee, Ty Votaw, was equally delighted. After coordinating the successful Olympic bid of his sport, he said: "We are elated the IOC membership has accepted golf as an Olympic sport, and look forward to seeing the world's best golfers compete for gold at the 2016 Olympic Games in Rio de Janeiro." Softball, squash, baseball, karate and roller sports all bid to be accepted as Olympic sports but were turned down by the executive board two months ago. Golf previously featured at the Paris Games of 1900 and in St Louis in 1904, while Olympic medals could be won by rugby players who contested the 15-a-side format from 1900-24. Meanwhile, Rogge has been re-elected unopposed as president. The Belgian will serve his final four years, which takes him through the London 2012 Olympics before stepping down in 2013, after being re-elected by 88 votes to one.